Vast quantities of scarce metals are being lost from Europe's urban mine of vehicles, including 20 tonnes of gold each year – and the proportion of critical metals in vehicles is continuing to increase. A database is now being published that charts the metals and facilitates recycling. On 8 March Maria Ljunggren Söderman, researcher at Chalmers University of Technology, will present the results at IEA's expert meeting. Metals, such as gold, cobalt and lithium, are an indispensable part of our batteries, mobile phones, electronic gadgets and vehicles. At the same time, Europe is highly dependent on imports of metals, which makes some of them critical for the EU. "These metals are required for the ongoing transition to greener technologies, such as electric cars, solar cells, LED lighting and wind power, so any supply risks are a strategic and economic problem for the EU. What's more, these are finite resources that must be used in a sustainable way," says Maria Ljunggren Söderman, Researcher at Environmental Systems Analysis at Chalmers University of Technology. She is part of the extensive European research project Prosum, which has now compiled a new database with which to address the problem. The Urban Mine Platform – the only one of its kind in the world – charts what is known as the urban mine: the metals that are already in circulation and could be recycled from our end-of-life vehicles and electrical and electronic equipment. Maria Ljunggren Söderman has been responsible for the survey of the 260 million light-duty vehicles in Europe's vehicle fleet. She notes that the quantities of critical and scarce metals have increased substantially, and that vehicles also now include many new metals. "This is mainly because we are constructing increasingly advanced vehicles, with a great deal of electronics, lightweight materials and catalytic converters. The increase in the numbers of electric vehicles adds to this development, even though they so far represent a small proportion of the vehicle fleet," she says. One such example is neodymium, one of the rare earth metals (REM). It is estimated that by 2020 there will be nearly 18,000 tonnes of neodymium in the active vehicle fleet – nine times the amount present in the year 2000. Gold is another example – and the researchers were surprised by just how vast the quantities of hidden gold in our vehicles actually are. In 2015 there were an estimated 400 or so tonnes of gold in Europe's vehicle fleet, while the vehicles that left the fleet contained in the region of 20 tonnes of gold – which, in addition, was not recycled. This means that gold worth many hundreds of millions of euros is wasted – each year. "Our calculation shows that that the quantity of gold in end-of-life vehicles is now in the same order of magnitude as the quantity in electrical and electronic scrap. This is an increase that cannot be ignored," Ljunggren Söderman says. 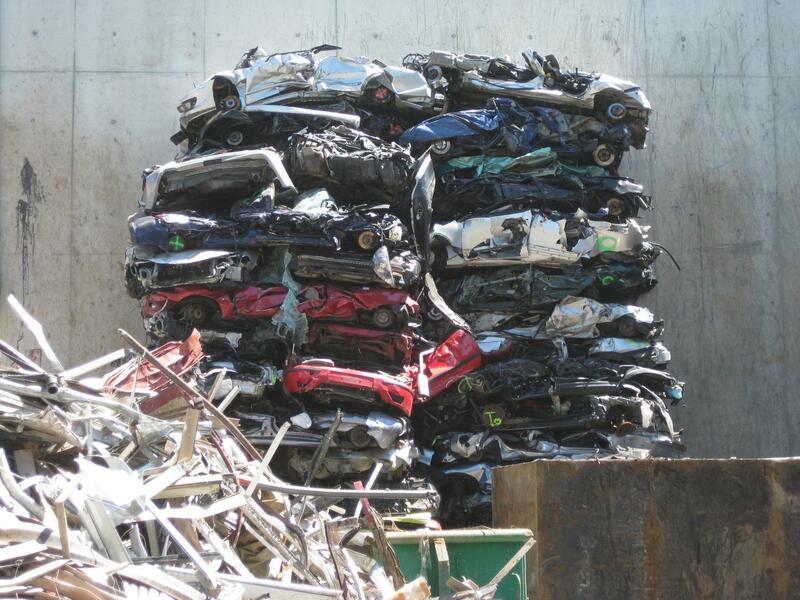 In general very little of the critical and scarce metals in vehicles is recycled. The major challenge is that they are spread out in small quantities; in a new car, for example, there may be a gram or two of gold distributed over several tens of components. But while the EU has clear requirements for the recycling of precious metals in electrical and electronic equipment, such stipulations are lacking as regards vehicles. "There are no requirements or incentives for recycling gold from vehicles, but there are clear economic values here that I don't think people have realised the extent of," she says. Maria Ljunggren Söderman hopes that the research findings will spur on a change. "Automotive manufacturers and the recycling and material industries need to work together to ensure that something happens. It must be possible to do more than at present – after all, this has been achieved with electrical and electronic equipment," she says. "Having said that, gold is a comparatively low-hanging fruit, and the prospects for recycling other critical and scarce metals are significantly less favourable – from both electrical and electronic equipment and vehicles. If we want to alter this, policy changes may be necessary." On 8 March Maria Ljunggren Söderman will present her research findings at an expert meeting on material trends and climate change within the area of transport, organised by the IEA, the International Energy Agency of the OECD countries. She emphasises that a change towards more recycling of metals is a key part of the EU's efforts to create a more circular economy. "The critical and scarce metals in our products have increased substantially, and in most cases we only use them once. This must be addressed, especially because these metals are required for many of the sustainable technological solutions that we currently have on the table," she says. In the international EU project Prosum (Prospecting Secondary raw materials in the Urban mine and Mining wastes) 17 parties from universities, research institutes and expert organisations have together surveyed the quantities of critical and scarce metals that can be recycled from Europe's batteries, vehicles and electrical and electronic equipment. The project is funded by the EU's Horizon 2020 research programme. The results are presented in the database called the Urban Mine Platform, which shows the route taken by the metals from when they enter the market until they become waste. The intention is to create a knowledge base to reduce the dependency on imports and harness the resources in end-of-life products more effectively. Chalmers Researcher Maria Ljunggren Söderman, from the Division of Environmental Systems Analysis in the Department of Technology Management and Economics at Chalmers University of Technology, has been responsible for the survey of the vehicles in the project. Duncan Kushnir from Lund University and Amund N. Løvik from Empa in Switzerland have also participated in the vehicle survey. In the EU, Norway and Switzerland about 10 million tonnes of electrical and electronic equipment and 2 million tonnes of batteries are disposed of as waste each year, while 14 million tonnes of vehicles leave the fleet. On average every individual in the EU owns 250 kilograms of electrical and electronic equipment, 17 kilograms of batteries and nearly 600 kilograms of vehicles. One single smartphone contains about 40 critical and scarce metals, with a concentration of gold that is 25-30 times higher than in the richest gold ores. The EU's, Norway's and Switzerland's vehicle fleets in 2015 contained about 30 tonnes of gold in new vehicles that entered the market, about 400 tonnes of gold in vehicles in use, and about 20 tonnes of gold in vehicles leaving the fleet. The Urban Mine Platform charts geochemically scarce metals, which means metals with a low occurrence in the Earth's crust. Many of the metals are also on the EU's critical metals list, which means that they are very significant for Europe's economy, at the same time that the risk of limited availability is high, mainly due to the considerable dependency on imports.